Propionic acidemia (PA), one of the more common organic acidemias, was first described in 1968 in an infant with severe metabolic acidosis, and many additional patients have since been reported. Propionyl-CoA is an intermediate in the oxidation of four amino acids (i.e., threonine, valine, methionine and isoleucine) as well as odd-chain fatty acids. Propionic acid is also absorbed from the large intestine where it is produced by propiogenic bacteria. Propionic acidemia is due to deficiency of propionyl-CoA carboxylase (PCC), a mitochondrial biotin-containing enzyme that catalyzes conversion of propionyl-coA to D-methylmalonyl-CoA. The disorder is extremely variable and identification through newborn screening is typical in the US. Methylmalonic acidemia (MMA) can be caused by an inherited deficiency of methylmalonyl-CoA mutase, an adenosylcobalamin-requiring enzyme that converts L-methylmalonyl-CoA to succinyl-CoA, or in the metabolic pathway that catalyzes the biosynthesis of adenosylcobalamin from vitamin B12. Patients with PA and MMA are at risk to develop episodes of acidosis caused by accumulation in these two acids when patients have otherwise mild illness or stress. 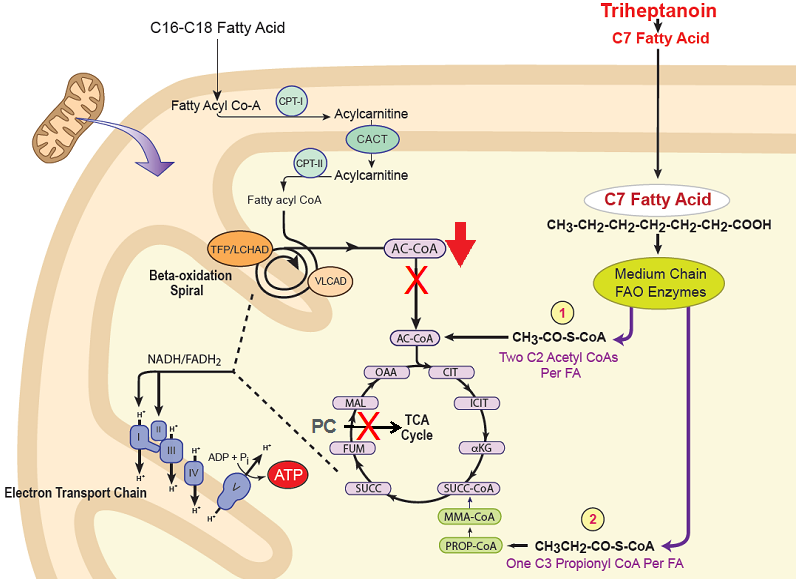 However, they also have an inability to make succinate, the final product in this metabolic pathway, and a key chemical in the tricarboxylic acid (TCA) cycle necessary for cellular energy production. It is likely that this energy deficit leads to significant secondary problems in patients with PA and MMA, including brain damage (in both diseases) and cardiomyopathy (in PA). For the last several years, my laboratory has studied a similar problem that occurs in patients with genetic disorders of long chain fatty acid oxidation (FAO). These patients develop a secondary deficiency of propionate that results in symptoms that include low blood sugar, muscle weakness, and episodes of acidosis. The usual treatment of long chain FAOs is with medium chain triglyceride oil, which can bypass the metabolic block, but doesn’t address the propionate deficiency. We have developed a novel drug, triheptanoin that both bypasses the block and restores propionate levels to normal. The drug is currently in clinical trials in patients and results of two phase 2 studies have shown resolution of hypoglycemia, and improvement in muscle and heart symptoms. We have now turned our attention to developing a similar compound to relieve that TCA cycle block in patients with PA and MMA. Ideally, delivering succinate directly as a drug would accomplish this result. Unfortunately, succinate in its pure form is a powder that has an extremely bitter taste and must be taken in large quantities to approach the amount needed to deliver appropriate amounts to cells once ingested. As with triheptanoin, we have elected to make a novel compound in which succinate is attached to another simple chemical, glycerol, to make a high-density oil that can efficiently deliver succinate to the body in a tolerable form. After making nearly three dozen variations, we now have a candidate drug that matches our requirements and are testing it for efficacy in mouse models. If these tests are encouraging, we’ll move to the next step to file for FDA approval to move to a clinical trial in patients, with a target to start in the next 1-2 years. ​Figure. Entry of propionate into the TCA cycle. Improvement in patients with long chain fatty acid oxidation disorders are seen when they are treated with a drug (triheptanoin) that increases propionate and thus, ultimately, succinate. Our new drug provides succinate directly to the TCA cycle, bypassing the block in PA and MMA.